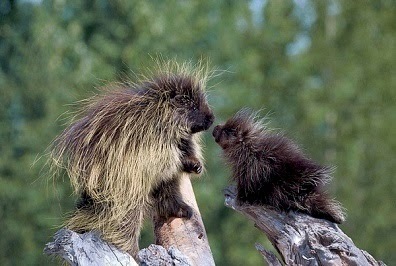 Have you ever seen a porcupine? They’re funny looking mammals in the rodent family. They live in North and South America, Southern Asia, Europe and Africa. The ones in North America are different than the others. 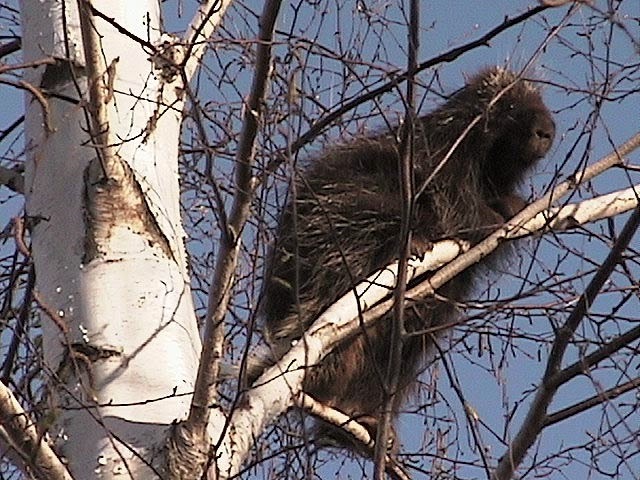 They are equipped with single quills all over their bodies and can climb trees. In fact, they love to be in trees where predators can’t get them. Our story is about a young porcupine named Corky who lives in North America, high in the mountains in the state of Washington. Like all babies, he was cute when he was born. 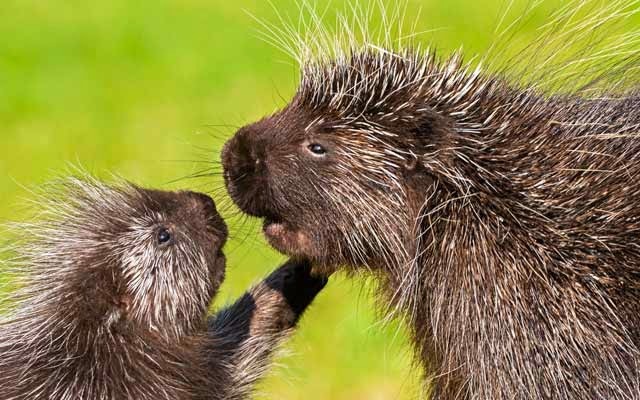 Porcupines are born with soft fur. In a few hours to a few days, the fur toughens up and become spiny quills. These quills come off very easily, especially when a porcupine is attacked. 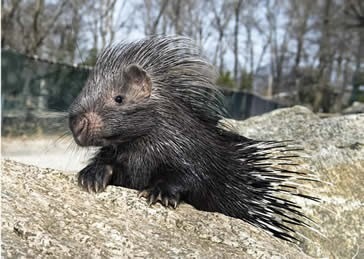 If a wolf or other predator tries to take down a porcupine and strikes, the quills get stuck in them. These quills are hard to pull out because there is a barb at the end which gets stuck. The porcupines quill will grow back after losing one. Most porcupines live alone or in small groups. They are not social animals, probably because they can hurt other animals so easily. 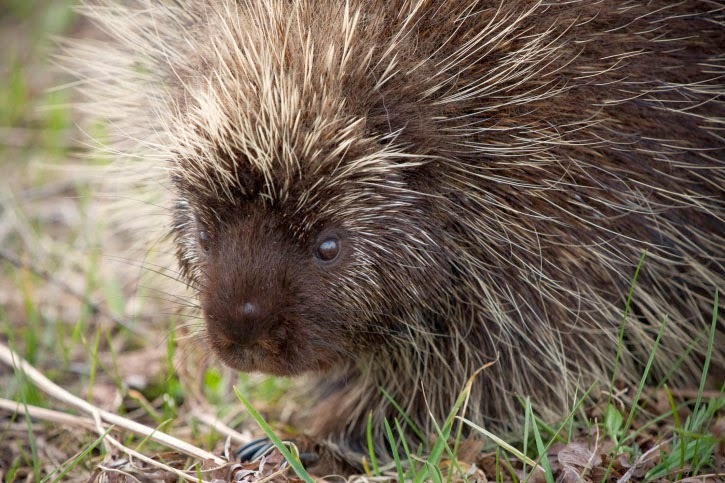 It's not a good idea to pet a porcupine unless the porcupine made its quills lie flat. Corky would not intentionally hurt other animals, but he can’t get close enough to them to tell them. He is sad because he doesn’t have any friends. He lives with his mom and they are the only porcupines around. Other animals shy away from him. Corky, like all porcupines, is a slow walker. This creates a problem because when he sees another animal he would like to befriend, he can’t get close enough fast enough to talk to them into staying. Corky complains and grumbles about this to his mom. His mom, Ashley, has tried to get him to be happy with the way he is made and realize porcupines live by themselves. “Never mind, there’s not much we can do except roll pinecones at each other.” As he said that he plopped down and put his head under his paws. She didn’t answer and he realized she was farther away than he thought. He became concerned because he had never been this way before and wasn't sure where his mom went. He walked on, but this time he kept his head up looking around and trying to hear her paw steps. Meanwhile his mom, Ashley, was in a jam. She had trotted a little bit faster than normal because she wanted Corky to think and get used to the idea of being alone. Soon, he would be old enough to leave her side and make his own way in the world. Ashley came across a bear eating the berries she wanted Corky to enjoy. The bear saw her and didn’t want her to have the berries or come close. In fact, he backed her up. She didn’t want to fight him so she backed up right into a bramble of thorns. She was caught. 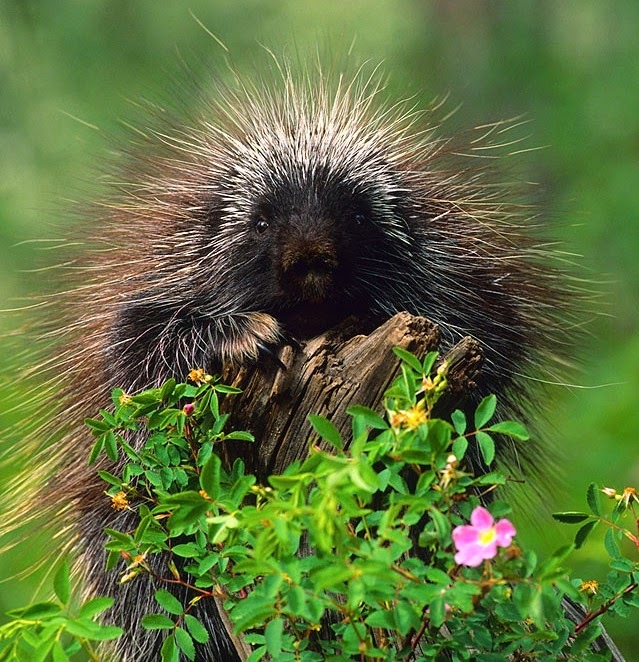 The thorns had entangled not only her quills but her fur as well. She was afraid of letting loose of the quills that could help free her, in case she needed them on the bear. Trying to decide what to do, she spied Corky. Corky didn’t know what to do. He was afraid of the bear because the bear was huge. He looked back at his mom and realized she was now struggling to free herself, which only made her more stuck. The bear took a few steps toward Corky with fury in his eyes. Corky had never been this close to any animal let alone a bear five times his size. Corky’s instincts took over. He turned his back to the bear and tucked his head. The bear swatted him and came away with quills stuck in his giant paw. This infuriated the bear. He opened his mouth to bite Corky. This time the quills came off inside the bear’s mouth. This was more than the bear had bargained for and didn't want to get more. The bear ran away crashing through the trees. Corky watched him run and heard him for quite some time. Corky thought the bear would come back and finish him. He was also afraid the bear might hurt his mom. He needed to help her get unstuck. Together using their teeth and paws, they were able to extract her from the brambles. With as much speed as two porcupines can go, they ran home to their tree. Corky learned many things that day. He learned dangers exist in the world. It was alright to be different. Corky didn’t complain and grumble anymore. He now understood to stay away from most animals. The best part was he realized he had the ability to take care of himself and his mom was proud of his bravery. In our Christian lives we can come across things that are similar to what Corky experienced. We can feel alone, singled out, or different than other people. God has called us to be His people living in the world but not participating in the wrong things of this world. Sometimes that makes us alone. When we take a stand about something no one else does, we may be by ourselves. The bear Corky encountered is a picture of people we need to stay away from. They are not doing right and might hurt us. It could even be our friend but now we see things they are doing and know we need to avoid them. The bear also symbolizes or makes a picture of sin we need to stay away from. Sin will eventually hurt us. Corky was complaining in our story. Complaining is something we shouldn’t do. Complaining or grumbling is a bad habit to get into. We need to bring our issues or request to the Lord and ask Him to help us through them. Contentment is something God wants us to learn. Contentment is being happy about the things in your life you cannot control or change, like your height or eye color. There is nothing wrong with growing, learning, and changing what we can. Our attitude may be one of the things we need to change. In all areas of our life we need to take the Lord with us. We need to ask Him if we should act a certain way, have a particular friend, or stay away from someone or something. He will guide you if you ask Him. He uses our parents to help us make those choices. Ask them those questions and they will be happy to answer. He leads me in the paths of righteousness for His name’s sake. Psalm 107:9 For He satisfies the longing soul, and fills the hungry soul with goodness. 2 Peter 2: 9a …the Lord knows how to deliver the godly out of temptations… James 4:7 Therefore submit to God. Resist the devil and he will flee from you. Memorize: Psalm 107:9 For He satisfies the longing soul, and fills the hungry soul with goodness. Or: Psalm 32:8 I will instruct you and teach you in the way you should go; I will guide you with My eye. Great, beautiful and ministering . Amen Victor, Thank you for being a blessing by posting your uplifting comment!